This product is packed with anti-oxidant powder and can be used regularly to gently remove dry/dead skin cells, renew skin exposed to daily pollutants and harsh environmental factors which is a key cause of aging skin. Featuring bio-degradable tube! SKU: 292 Categories: Masques, Beauty Through Balance Brands: Beauty through Balance. This two in one exfoliation and mask treatment will reveal your skin’s true radiance. Organic Acia Fruit Pulp, Olivate from pure Olive oil, and Vitamin C will renew and re-energize dry/mature skin that has been over exposed to harsh environmental factors. Can be used 3 to 4 times a week to remove accumulated dry skin while infusing omega fatty acids for more vibrant youthful appearance. 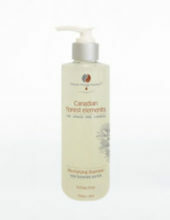 An excellent treatment to also use for anti-aging hand care. Olivate is an advanced anti-aging ingredient has been clinically tested and studied to show its direct benefits to restore moisture levels from deep within. Benefits *Advanced Anti-oxidant care for the face. *Addresses signs of age caused from exposure to harsh environmental condition. *Improves the skin's radiance and vibrance by infusing Omega Fatty Acids into the skin. 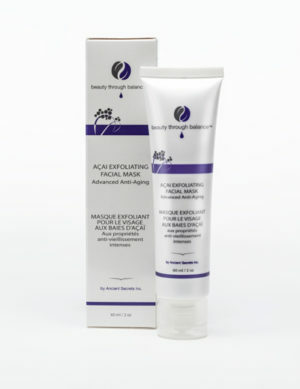 *Excellent treatment for anti-aging hand care. *Packaged in a recyclable and bio-degradable tube. Recommended Use Use 2 to 3 times per week as a 2 in 1 exfoliant and mask on skin that is dry/mature and non-sensitive. Ingredients Key Ingredients: Organic Acai Fruit Pulp, Olivate from pure Olive oil & Vitamin C.